Carrying a backpack and canoe overland on the 1.5 mile portage from Carry Falls Reservoir to the put in on the Jordan River gives one the time and motivation to consider what items could have left behind next time to lighten the load – spare canoe paddle, extra shirt, and second bottle of water? Fortunately, bug repellent wasn’t one of the items left behind. Skip, Steve and I used two reports by North Country Radio reporter, Brian Mann, an article in the Adirondack Explorer by Phil Brown and a customized map from www.MyTopo.com to plan our recent canoe camping trip on the Jordan River. 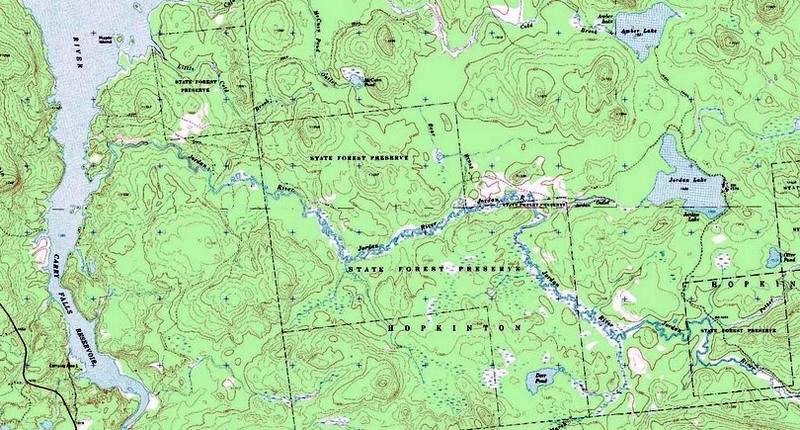 The mouth of the Jordan River appears on the USGS Carry Falls Reservoir quadrangle along the east shore of the reservoir. To access the launch site locate mouth of Jordan on E shore of reservoir. Four small bays north of the mouth of the Jordan is a narrow cove with old abandoned automobiles on shore there. Landing here one will find an old logging road kept open by ATV’s. Two old junkers parked nose to tail where trail enters woods will confirm you have the correct trail). 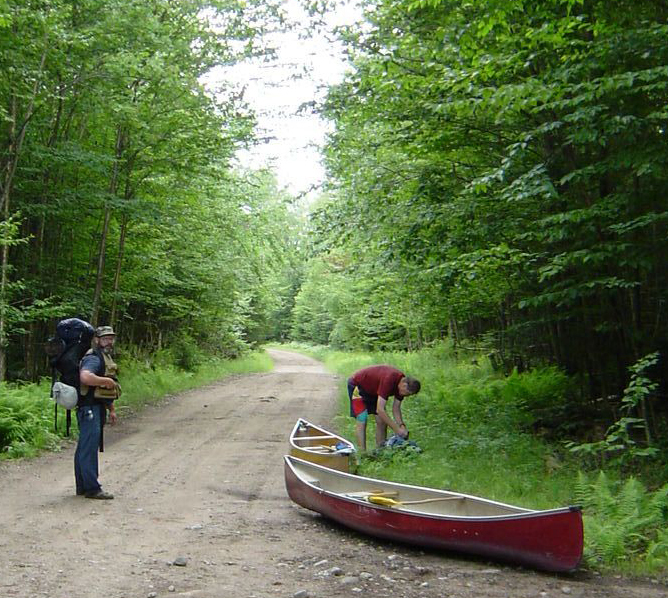 We carried our two canoes along dirt roads staying to the right at every junction. After about 20 minutes we passed through an open meadow which marked the halfway point. 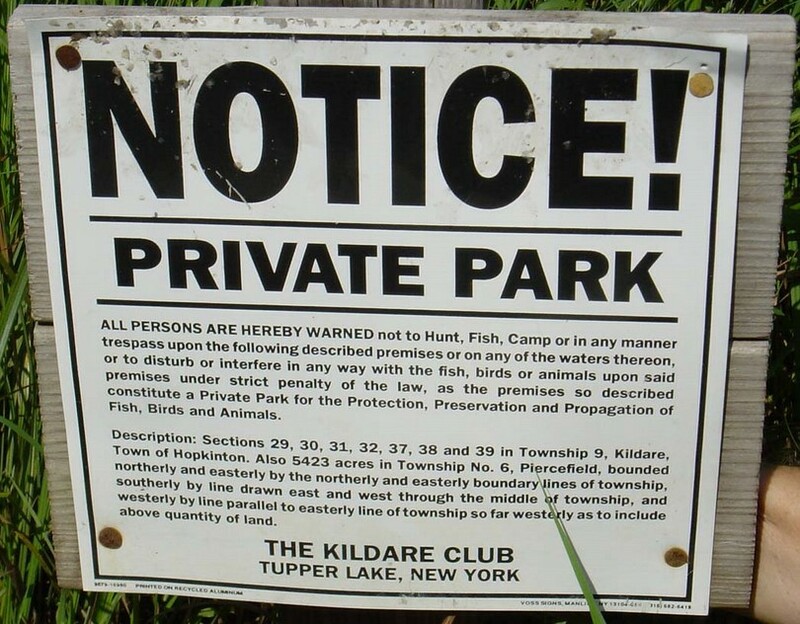 At the intersection of an obviously well traveled gravel road which is used for private access to camps, again turn right and launch from the bridge approximately 300 yards down the road. It took us about 45 minutes to make the carry from Carry Falls Reservoir to the launch site. 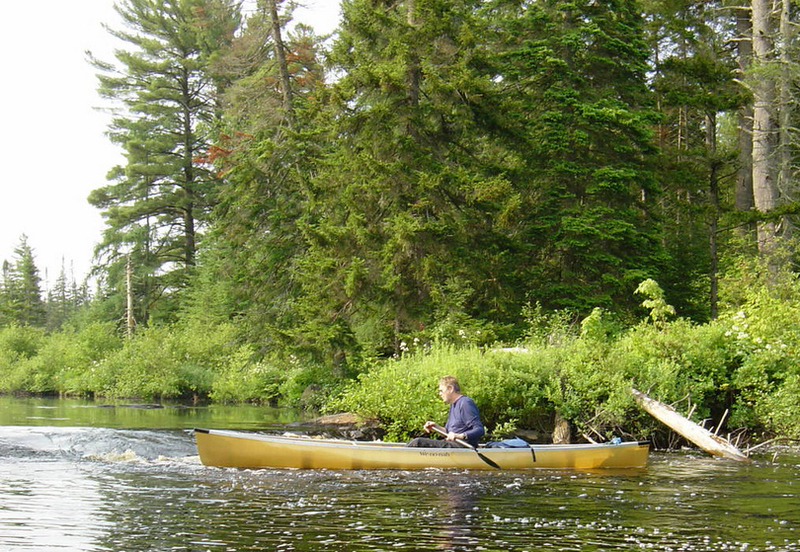 We put in at the Parmenter boat launch at 9am crossed the reservoir, completed the portage and were paddling upstream at 11:30am. 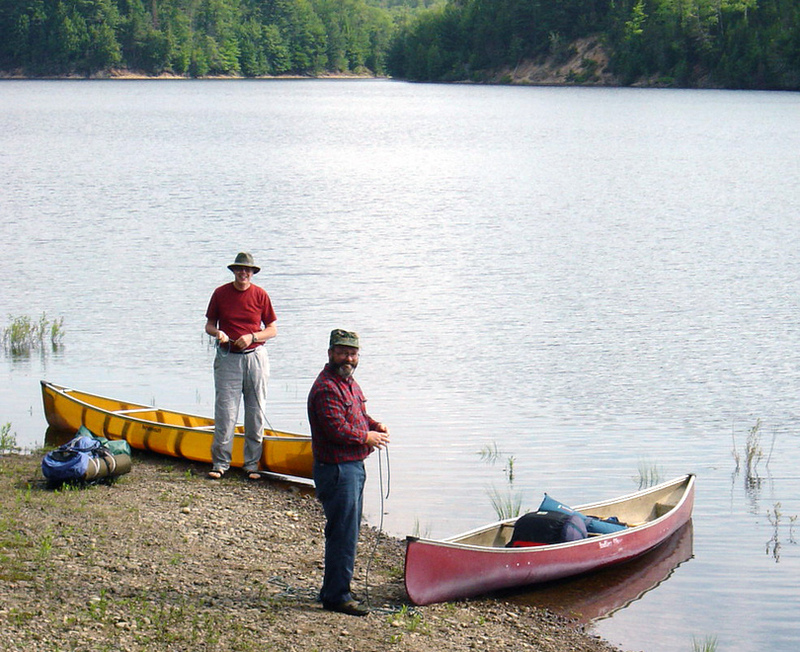 My companions, Steve & Skip, were confident that the steep bank provided a good opportunity for them to capture a “canoe entry dunking” on camera. They were posed and ready, but fortunately I slid into the Prism solo without a hitch. 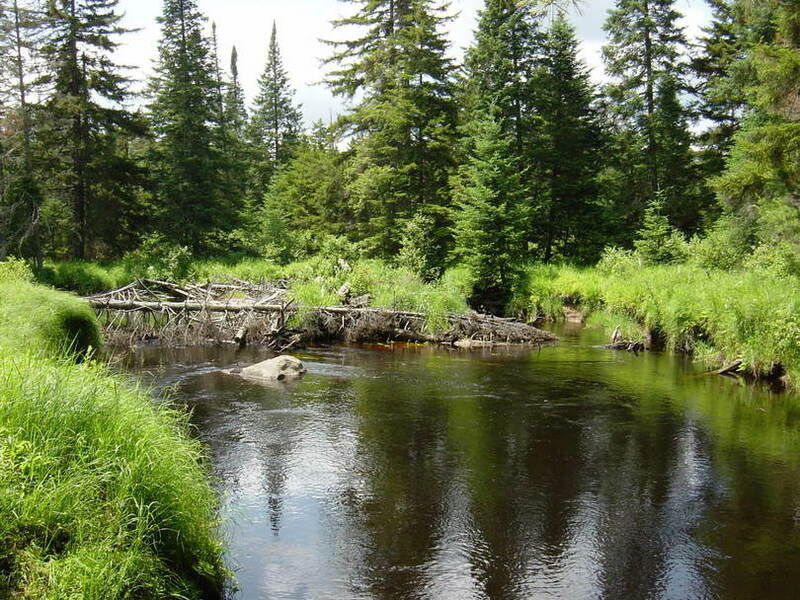 Jordan River is a small tannin colored river with its lower portions edged by large white pine trees interspersed with tamaracks. 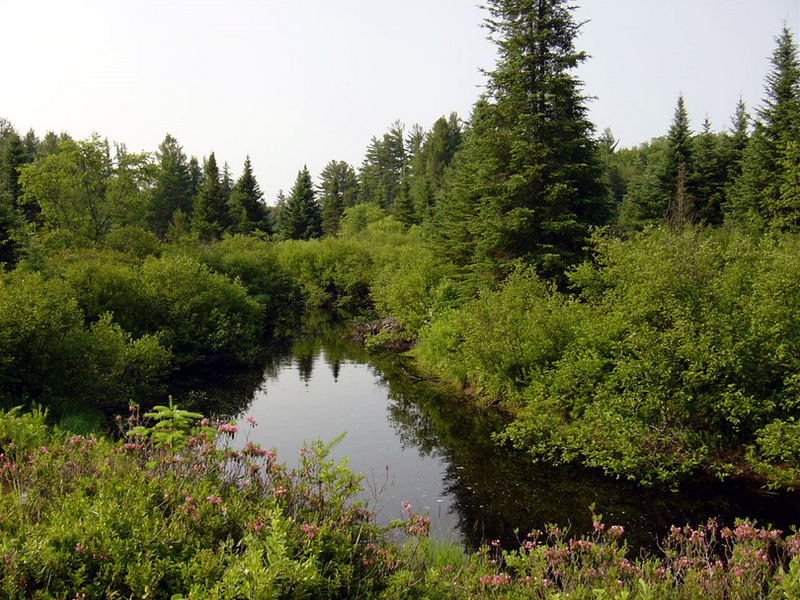 The upper stretches of the river are crowded with alders that come close enough to form tunnels in some places. there’s a beaver dam right upstream. blocking our canoes – not letting us by. 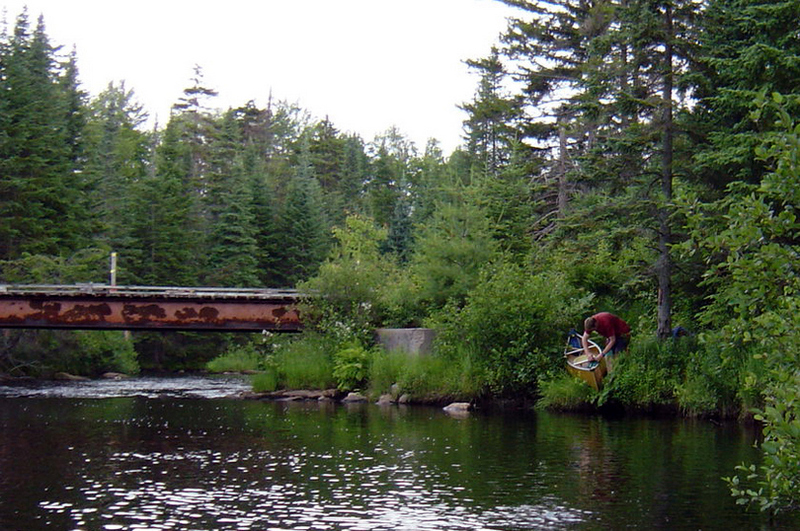 Elsewhere the Jordan was obstructed by logjams and one large rock ledge that required a short portage or lift-over. The Jordan River is not for everyone- it’s about 20 feet wide on average and meanders north and south as much as travels east to west. 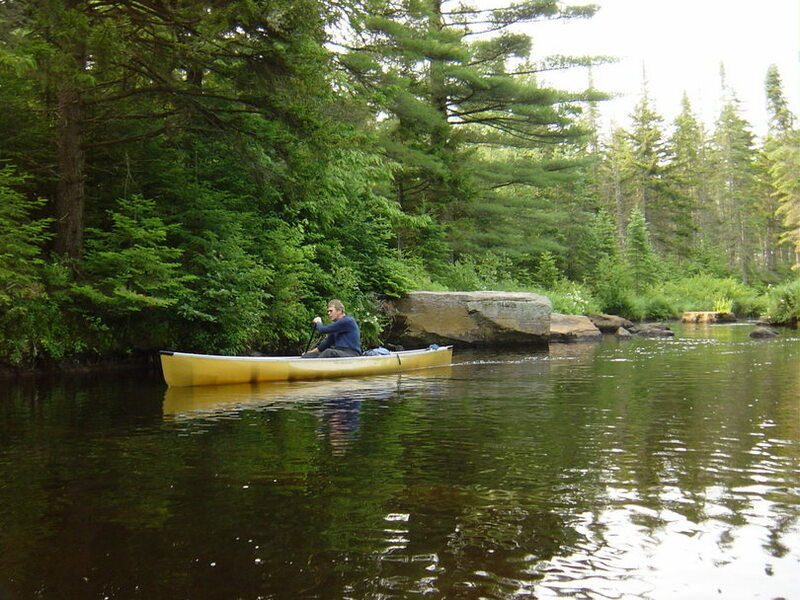 As the river meanders southeast, some meanders incorporated hairpin turns that caused us to come to a full stop, reposition the canoe to turn, and then proceed upstream. Due to the meandering river, the lack of mountains in the distance, and the remoteness of the area we had an ongoing debate to determine exactly where we were at any one time. 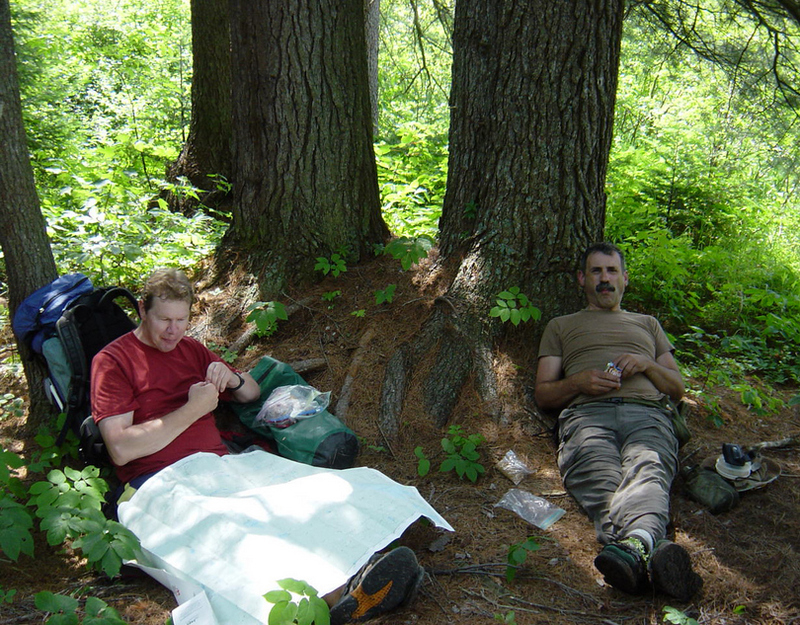 Below Steve and Jim have a snack while Jim consults the map. We paddled until 7pm, motivated by a desire to determine our exact location and the numerous mosquitoes that swarmed as soon as we stopped moving. We terminated our trip at the point the Jordan River left State Land where the Private Property sign confirmed our location. We estimate we completed 12-14 miles of the 18 navigable miles of the Jordan. After reaching the Private Property sign, we retreated onto the State Land to a small bluff with large white pines that offered an opening and a chance of a breeze. 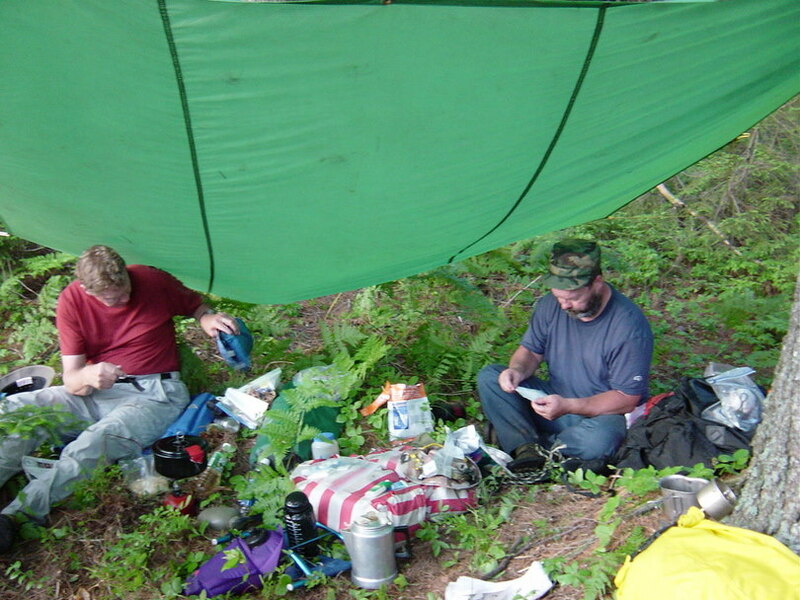 Once we set up our tents, we had a small brief shower, so we sat under a dinner tarp and swatted mosquitoes as we filtered water and cooked dinner. Bug repellent largely deterred the bugs from biting, but invariably mosquitoes found an untreated spot to attack. After a quick swim to wash off layers of sweat, sunscreen and bug repellent we fell asleep listening to the hum of mosquitoes outside of the tent. During the night, we heard the slap of beaver tails surprised by the appearance of canoes on the bank. The ride downstream the next morning was quicker, the portage seemed longer, but the swim in Carry Falls Reservoir was oh so rewarding. As a distraction during the portage, we discussed alternative ways to accomplish the trip; either as a day trip to lighten the load or as a 3 day trip to allow camping on other state land located further east on the Jordan River. Other options would be to travel in early May or in September to avoid the bugs and have a little more run off to allow floating over some of the obstacles. All in all the Jordan River was one of the more remote trips we have taken lately and provided access to a portion of the Adirondacks not seen by most visitors.